Not too far away from the SoGo department store in the Zhongxiao Dunhua district is the unique VVG Bon Bon (13, Lane 161, Dunhua S Rd Sec 1, Taipei 台北市敦化南路一段161巷13號). One of the most interesting places I have been to in Taiwan so far, this spot is great for a leisurely afternoon lunch or for high tea. The decoration inside, the general vibe and the clientele (from what I saw today) here is almost too cute for words. Housing an eclectic collection of items (silver glitter antler horns, a smiling child sized giraffe, several foot tall wooden nutcrackers, plastic cakes etc.) that would otherwise seem tacky or overdone on their own, VVG Bon Bon finds a way to make the pieces work together to create a fun atmosphere. Almost everyone inside the restaurant was taking photographs despite the sign prohibiting it – two ladies dressed in otaku even had a professional camera man there to snap their pictures for a solid hour (after speaking with them, we found out that they were just doing it for fun, not for any specific reason). To drink, we had some freshly squeezed plum and pomegranate juice as well as a pot of honey lemon tea. I ordered the afternoon menu set which included a salad, pumpkin soup, freshly squeezed house grapefruit juice, duck confit with caramelized fennel on a potato puree, mushrooms, assorted veggies topped with cheese as well as a chocolate hazelnut cupcake to finish. The other tea set included the same side items but a different main – lasagna. Both were quite good – not the best food you’ve ever eaten, but certainly not the worst. You’re there mostly for the feel of the place. I would suggest making reservations if you’re interested in visiting VVG Bon Bon – we walked in without one and almost didn’t get seating. Instead we had to share a table with another group which wasn’t bad at all. Check this place out for some majorly sweet vibes. 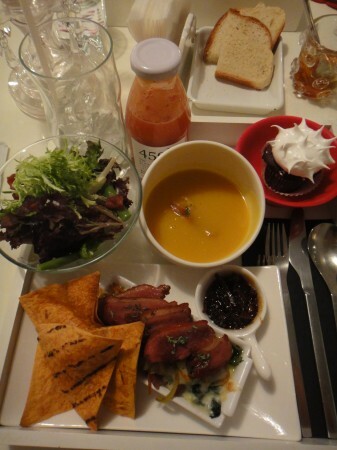 Tags: Afternoon Tea, Confit, Corn Chips, Cupcake, Duck, Freshly Squeezed, Grapefruit, High Tea, Honey, Juice, Lemon, Mushroom, Orange, Plum, Pumpkin, Salad, SoGo, Soup, Taipei, Taiwan, Tea, VVG Bon Bon. Everything looks so cute there, I love it! !